The latest in a series of posts from Seaport’s wedding and social event expert, Leah Malin. While making the shift from Eco to I Do can be challenging, for some couples, it’s essential. Whether they are truly passionate about reduce, reuse, recycle or simply interested in saving money, many modern couples are making their weddings both eco-friendly and chic! Although Earth Day may have come and gone, it’s still a good time to consider some ideas that save resources. For many modern brides, invitations are no longer the priority we have seen in years past. The time, and effort that goes into addressing and stamping causes stress and also has a price tag. Paperless Post was the pioneer in this area, but Evite has also expanded offerings. My personal favorite, Greenvelope, has options for RSVP tracking and messaging-what a great way to save some cash but also can get reminders and details out to guests! These not only save the paper and elements of the invitation itself, but also packaging, and the footprint involved with shipping to you, mailing to your guests and return RSVP service. If you do opt for paper, choose recycled paper and be sure to add a note letting your guests know it will be an eco-friendly wedding and of course, remind them to recycle the invitation! As it relates to the Wedding gown, simply Google "Eco Friendly Wedding Dresses" and you will get pages upon pages of search results. With vintage trends being on the rise, romantic dresses from years’ past are always special. This is also a wonderful way to incorporate a family gown, which passes down a story from generation to generation and personalizes the day for your guests. As it relates to the Bridesmaids, we are seeing more and more brides move from one set look and fabric, to more individuality. By having your girls don a dress they may already have (in something that matches the scheme of course) you eliminate stress, save your maids some money and ultimately will reap the benefits of better photos, as everyone has a much better smile and a better time at the wedding when they are comfortable and haven't broken the bank to make the night possible. What is eco-friendlier that skipping the waste of bags, boxes and bows for bridal shower and wedding gifts? More and more couples already live together and in many cases, already own their home together. This makes the notion of the traditional china-pots-and-pans registry less of a priority now than ever before. With this, many couples are opting out of picking up a scanner gun and are registering for experiences, honeymoons, or even cash. 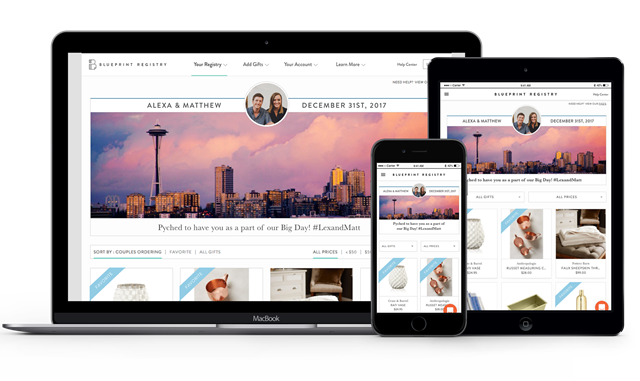 Sites like Zola and Blueprint Registry allow couples to customize their experiences. In addition to being more green, it also saves time and energy for your friends and family, not to mention a trip to the mall.